How to get there: There are several trail leading up to this prominent summit. Most people hike either from the top of the gondola cable, or from the east side. 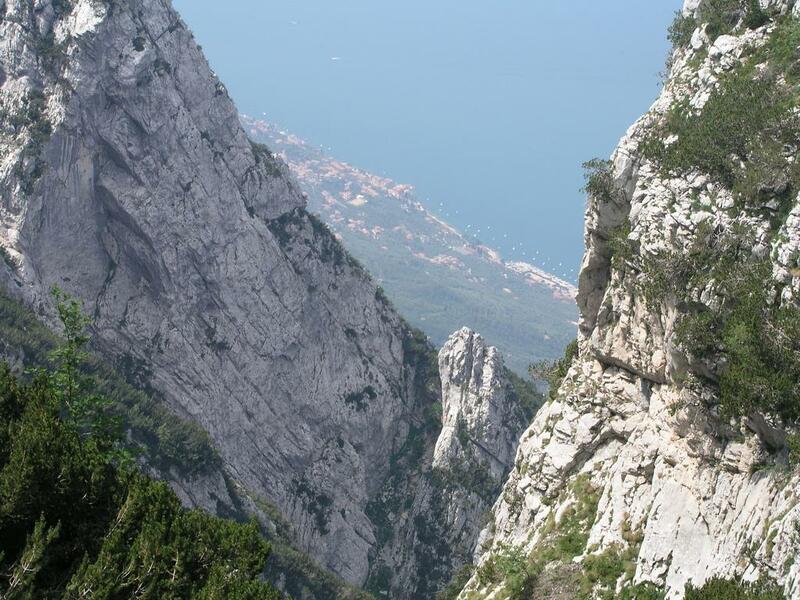 However, the best views and perhaps the most proper climb is certainly achieved by starting from one of the small roads/villages on the east shore of Lago di Garda. Our recommended trail head is near Saint Maggiore. 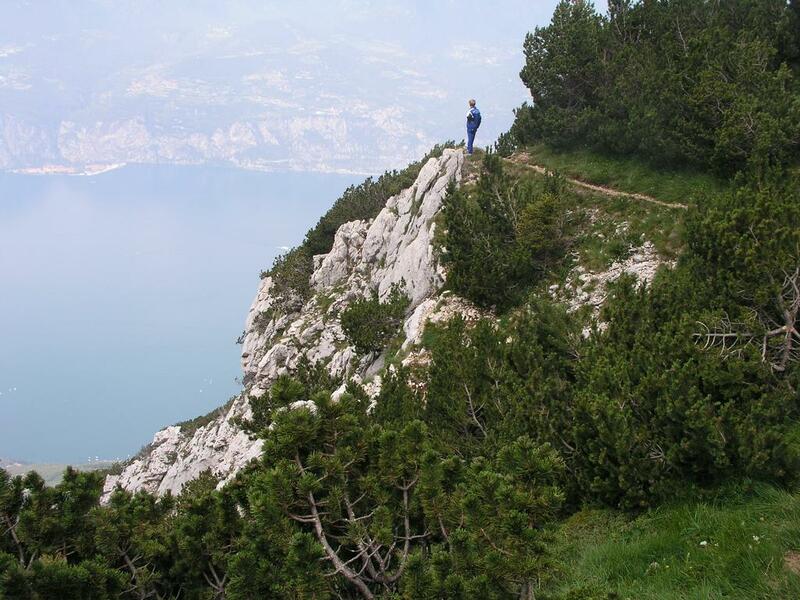 On the map, this is 1.75 km south-east of the bottom cable car station in the village of Malcesine. Malcesine is about 14 km from the northern end of Lake Garda, going south on the east side of the lake. From the easily located bottom station of the cable way, take a very narrow road that heads uphill on its right (south) side. Follow this road uphill, it will connect to a somewhat larger road coming up from your right. Continue on this larger road in a few switch back curves (tornantes), follow signs that reads "S. Maggiore". Soon, you will drive past the last house (down on your right) you are now at the trailhead. (A wooden fence on the right hand side of the road ends and the road curves a bit right.) There is parking here for a couple of cars. It is permitted to drive further a short section of rough road, however there is little point in doing so. The precise location of this trailhead is at elevation 437 meter, North 45:45.070, East 010:49.131. Route description: This route can be divided into three sections as it follows three numbered trails. The first section, follows trail number 1. Continue along the gravel road where you parked. After a short level section, this road climbs steeply. The road is partly made of concrete slabs in order to resist erosion on the steeper sections. Finally, (perhaps after 30 minutes) the road curves left and emerges on a flat area that is farmed. There is a house right in front. This marks the end of trail number one. The next trail, number seven, heads left along the edge of the field. There is a sign there, estimating the next section to take one hour and twenty minutes. Continue along trail 7 as it contours north along the hill. The beginning is fairly level, with a short section having even a discouraging (since we have much vertical to gain) gentle downward slope. However, as the trail approaches a steep drainage (dry creek with many rocks) the introduction is over. From here, the trail climbs steeply in zig-zag turns to gain a ridge higher up and further north. After the switch-backs, the trail continues on a long climbing traverse in the hill, then a few more zig-zags and finally, a level section leading you to the intersection with trail number 5. Continue sharply right along trail number 5. There is a sign here estimating the time to the summit to 4:15 hours. This is, however, rather conservative. 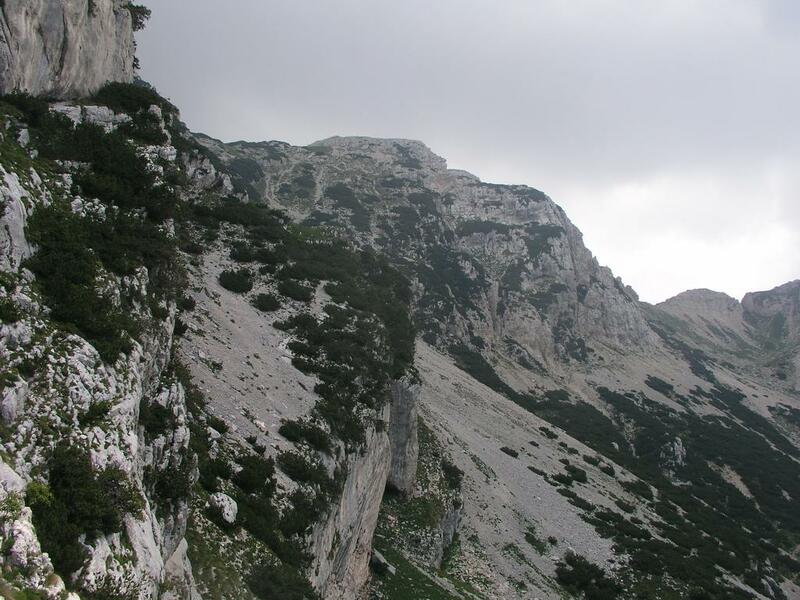 A strong hiker should easily do this last section in less than 3 hours. The first section of trail 5 is fairly level, heading south. Soon, however, the trail heads up and continues a fairly steep climb until a level area where we had a rest, location: North 45:43.952, East 010:50.023, elevation 1724 meter. Shortly after this place, one arrives at the end of a local ridge giving a view into a high valley. The summit can be seen up on the left, the remainder of the trail to he mountain crest is also visible. There is a brief descent into this valley before the final climb to the crest (location: north 45:43.398, east 010:50.658, elevation 2108 meter) where the trail merges with trails coming along the top ridge from both north and south. From here, a short climb on a very wide and clearly well maintained path leads to the summit ridge. The cross is at the south end, however, the highest point is a few meter further north along the ridge marked with a small cairn. This entire route follows well marked trails and is a (YDS) class 1 climb. However, hot summer weather and the 1800 vertical meters to be gained requires good physical fitness. Bring a bit more water than normal, you are likely to get very thirsty. Comments: Note that Monte Baldo is used for the entire mountain area east of lake Garda, having several independent summits. 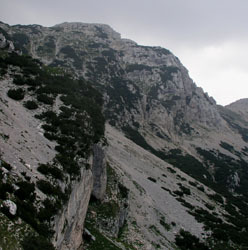 Cima di Valdritta is the name of the highest summit on Monte Baldo. 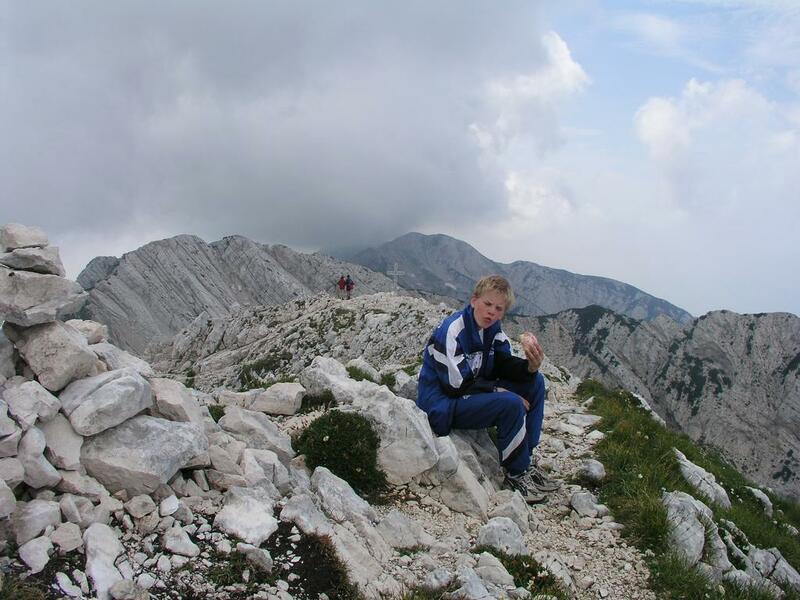 I did this hike with my son Pål Jørgen, age 15. We left the car at 0850 along trail number 1, changed from trail no. 1 to trail no. 7 at 0915, arrived at the junction between trail no. 7 and trail no. 5 at 1010, made the summit at 1210. After 20 minutes with a very nice view all around while having lunch, we started down at 1230, drank our final few drops of water at the trail 5 to trail 7 junction at 1350. Hiking down trail 7 took 40 minutes, then a final 15 minutes steeply down trail 1 to our car. All together close to 6 hours. This was our last big prominence hike on this 2 week family visit to Italy. A bit more than 1800 meter vertical in 3:20 is not bad considering the hot summer weather. I cannot remember previously seeing so much sweat running of the face of Pål Jørgen. Thus, we both had a final workout that made us look forward to and enjoy swimming in Lago di Garda in the afternoon. This concluded what had been a very successful trip to Italy. Cima di Valdritta from the trail. Dramatic landscape high above Lago di Garda. 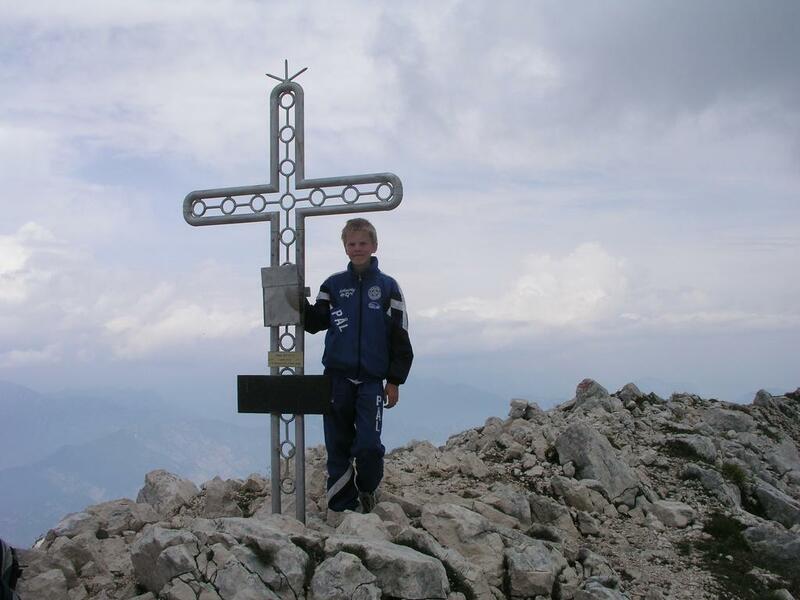 The highest point on Monte Baldo is called Cima di Valdritta. Puenta Telegrafo, 2200 meter, in the distance. The cross at Cima di Valdritta. 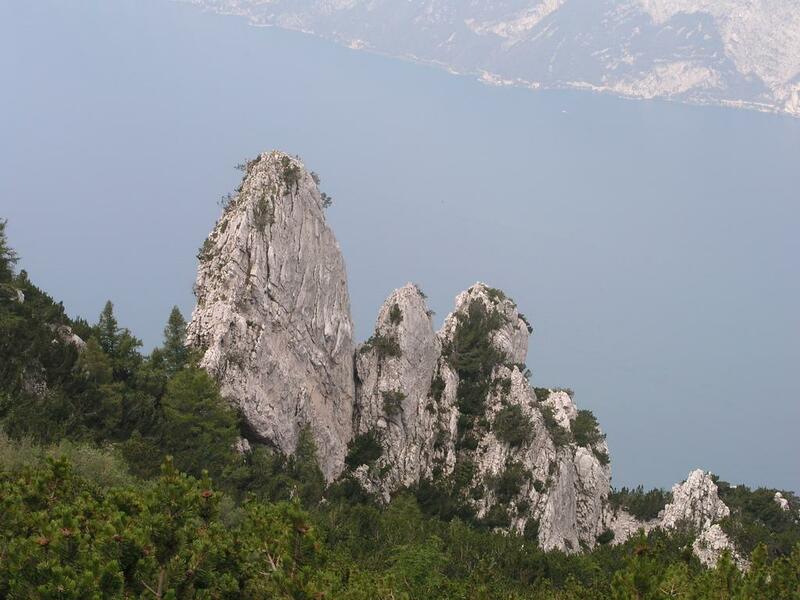 Rough terrain with Lago di Garda behind. The view to Lago di Garda is very nice.